House of Propellers presents, in collaboration with curator Cecilia Brunson, the first UK solo exhibition of the Chilean installation painter Josefina Guilisasti. Always using painting as a representational medium, Guilisasti creates large-scale multipart painted installations. Her works explore ideas of discontinuity, fracture, contradiction, and historical anachronism. This seven-canvas exhibition takes its cue from Charles Darwin’s travels through South America. Titled “Souvenir,” each of the seven unframed canvases depicts one species that Darwin described as an anthropological curiosity. For instance, one of the themes evokes the story of Jemmy Button - the native Yaghan from Tierra del Fuego who was brought to England by Captain Fitzroy in HMS Beagle and became an anthropological celebrity. The paintings do not hang on the wall as a menagerie of curiosities might: instead, they rest unframed organized as one would organize a series of chronicles. The painted image is a replica of Darwin’s representations. Guilisasti appropriated and shaped the image into determined consumable souvenirs. 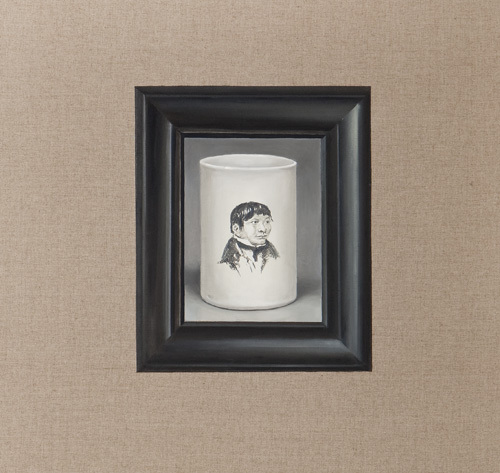 The depiction –of an owl or of Jemmy Button within others- is placed on a ceramic cup and like a souvenir, to be bought and consumed. Though Guilisasti paints her seven paintings in the dry style of the naturalist painters, she does not create naturalist paintings in the descriptive sense, with brilliant colours: instead, she reduces her palette to black and white, with no sheen at all, and there, the still life –of Darwin’s species— quite simply becomes a painting of objects. Methodologically, Guilisasti puts herself through the exercise of painting the model as Darwin understood it, ultimately losing sight of the original point of reference and situating the gaze of the artist in some anonymous place. Lending the object a de-naturalized identity. Josefina Guilisasti (b.1963) she earned her degree at the University of Chile in 1981-1985. In 1990-1992 studied painting at the stage of Teatro La Scala in Milan, Italy and was responsible for producing the stage set of various operas. In 1997 she participated in workshops with artist Eugenio Dittborn. Since 1999 she has devoted her practice to reading and interpreting literary texts with writer Natalia Roa in yearly workshops. Her paintings and installations are very much informed by these literary workshops. Because of her interests in creating an operation centre that was interdisciplinary around the visual arts in Chile, in 2005 she co-founded INCUBO with Cecilia Brunson. Recent exhibitions include “Marfa–Puerto Viejo”, Blanton Museum of Art, Austin, Texas. “Southern Exposure”, Dumbo Arts Center, New York, USA; “Itinerancia,” Mercosur Biennial, Porto Alegre, Brazil; “Fragmento II”, Cisneros Fontanals Art Foundation, Miami, Florida, USA. “Fragmento I”, Bienal de Pontevedra, Galicia, Spain. “Marking Time: Contemporary Art from Chile,” Blanton Museum of Art, Austin, Texas. Her work is found in numerous private and public collections such as Patricia Phelps de Cisneros and Blanton Museum of Art, Austin, Texas within others. Cecilia Brunson (b. 1972) is an independent curator based in London. For more than a decade she has worked in New York and Latin America. Her career began in 1991 in New York at the age of nineteen. For ten years she built a collection of Latin American art for the Edwards publishing family. In 2001 after graduating from the Centre for Curatorial Studies at Bard College, she was appointed Coordinator of Exhibitions at The Americas Society in New York. This was followed by an invitation to be Associate Curator of Latin American Art at The Blanton Museum of Art in Austin, Texas. Because of her interest in supporting emerging artists and bringing to light the work of up-and-coming curators she founded INCUBO in Chile. This was a residency program for international curators to innovate and experiment with different formats for exhibitions, lectures and publications. She recently co-founded the AMA Fellowship, a grant that facilitates residencies abroad for Chilean artists. Her writings appear in Artforum and in numerous artist catalogues.